On Monday 24 February 2003, Silverstone played host to a historic event in the world of motorcycle racing - the return of British manufacturer Triumph to racing after more than 30 years. Triumph teamed up with specialist racing company Valmoto to enter into the 2003 British Supersport Championship. Jack Valentine recognised the potential of the Triumph Daytona 600 as a serious contender in the Supersport class and contacted the Hinckley based manufacturer to see if they were interested in running a race team. Triumph had no hesitation in saying yes and the Triumph Valmoto British Supersport team was born. Jack Valentine was highly committed to the project but he was also extremely realistic in his approach in terms of allowing the two-rider Triumph Valmoto team a full year for development. It paid off in the team's first year of existence with a podium finish and a pole position. The team's first year also yielded victory at the Isle of Man TT with Bruce Anstey. 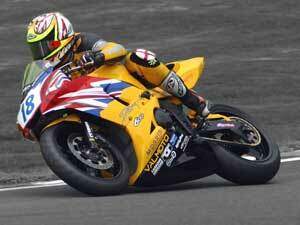 Triumph Valmoto continued racing in the 2004 British Supersport Championship with a one-rider team of Craig Jones. Jack had chosen the talented young rider for his mix of youth and experience and his hardworking and professional attitude. Craig repaid Jack and the team handsomely with stunning performances and a race win at the final round of the series at Donington Park.